We are currently focused on nonlinear wave phenomena in optical fibers. In one project, we develop fiber lasers that generate ultrashort light pulses. In another, we investigate nonlinear wave propagation in multimode fibers. See below for our most recent publications. Walter Fu and Frank W. Wise, “Normal-dispersion fiber optical parametric chirped-pulse amplification,” Opt. Lett. 43, 5331-5334 (2018). An ongoing limitation of fiber lasers is their lack of broad wavelength tunability. Here, we address this problem using fiber optical parametric chirped-pulse amplification (FOPCPA), which combines the energy capacity of chirped pulse amplification with the spectral flexibility of optical parametric amplification and the practical benefits of fiber. Notably, this is the first FOPCPA to be pumped in the normally-dispersive regime, which permits phase-matching far from the pump wavelength. The system operates by coupling a stretched, broadband pump pulse and a continuous-wave signal into a photonic crystal fiber. At each point in time, the monochromatic signal interacts via four-wave-mixing with a different wavelength of the chirped pump, resulting in an idler that is chirped in exactly the same manner as the pump. Scalability follows from the timescale-invariance of this process: stretching the pump at constant peak power likewise stretches the idler at constant peak power, increasing the energy without affecting the dechirped duration. 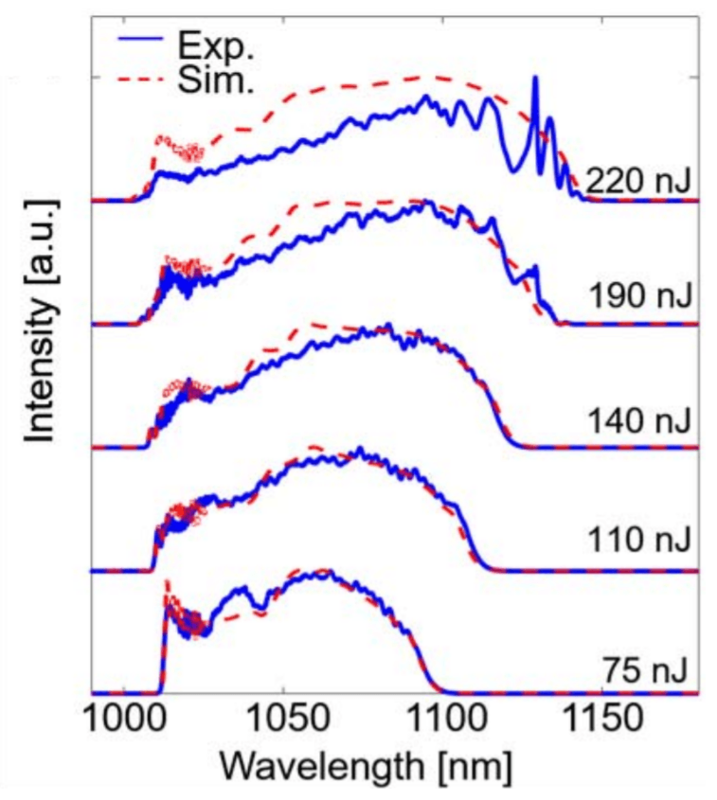 By exploiting this property, we are able to convert pulses from the Yb-band to the important bio-imaging window near 1300 nm, with energies of >100 nJ and femtosecond-scale durations. P. Sidorenko, W. Fu, L. G. Wright, M. Olivier, and F. W. Wise, “Self-seeded, multi-megawatt, Mamyshev oscillator,” Opt. Lett. 43, 2672-2675 (2018). As was shown by Liu et al., the pulses from a Mamyshev oscillator can be enhanced by increasing the spectral separation between the two bandpass filters. However, this comes at a cost: the same mechanism that strongly stabilizes the pulse against continuous-wave breakthrough also suppresses the weak electric field fluctuations that are needed to initiate pulse formation. Thus, a Mamyshev oscillator may be constructed that supports very high-energy pulses, but which can be mode-locked only with the aid of an external seed source. In this paper, we address this problem by showing how a simple auxiliary cavity--a "starting arm"--may be embedded into a Mamyshev oscillator, enabling the oscillator to seed itself at the flip of a mirror. A video of this process can be viewed here. We have furthermore scaled part of the cavity to fiber with a 10-micron core diameter. The result is a fiber oscillator with self-starting-like behavior that can deliver 190-nJ, 35-fs pulses without any external amplification, for an unprecedented peak power of 3 MW after dechirping. L.G. Wright, D.N. Christodoulides, and F.W. Wise (2017) “Spatiotemporal mode-locking in multimode fiber lasers,” Science 358 (6359), 94-97. Unlike a conventional single-mode, 'one-dimensional' laser, the frequencies of a multimode, multidimensional laser are ordinarily very complicated (figure below, top left, where different colors correspond to different spatial modes). However, we showed that, for a properly designed laser (bottom), the laser's frequencies would adjust automatically into an organized, synchronized pattern (figure top right), corresponding to the emission of a 3D, multimode laser pulse at regular intervals. Pulses from this laser might eventually allow very sophisticated light-matter interactions, especially with complex molecules (different modes of the laser may interact with different 'modes', specific transitions, of molecules or other matter). We have some moderately crazy ideas to realize PW or even EW (exawatt) lasers with this approach. Zhanwei Liu, Zachary M. Ziegler, Logan G. Wright, and Frank W. Wise. “Megawatt peak power from a Mamyshev oscillator” Optica, Vol. 4, Issue 6, pp. 649-654 (2017). 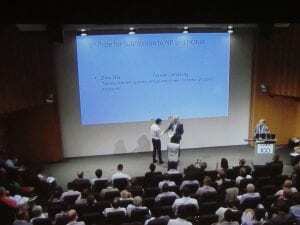 Historically, it has been really tough to make an ultrafast fiber laser that is both environmentally stable and that has good performance (i.e., it has similar performance as a Ti:sapphire oscillator). Recently, several groups have realized that a pair of spectral filters, each offset from the center of the laser gain spectrum, can be used as an effective saturable absorber. An intense pulse will experience nonlinear spectral broadening within fiber in between the filters, and can oscillate stably in a ring cavity formed in this way - a laser we call a 'Mamyshev oscillator' (see figure). Low-intensity pulses, or continuous-wave lasing, are meanwhile strongly attenuated. This mechanism, first proposed by Pavel Mamyshev for signal regeneration in telecommunications, is fully compatible with environmentally-stable laser designs. In this paper, we show that the Mamyshev oscillator can, when combined with the self-similar evolution of parabolic pulses, actually support extraordinary performance. Our initial experiments already show 10 times higher peak power than the previous state-of-the-art, and we are optimistic about further improvements. Walter Fu, Logan G. Wright, and Frank W. Wise. 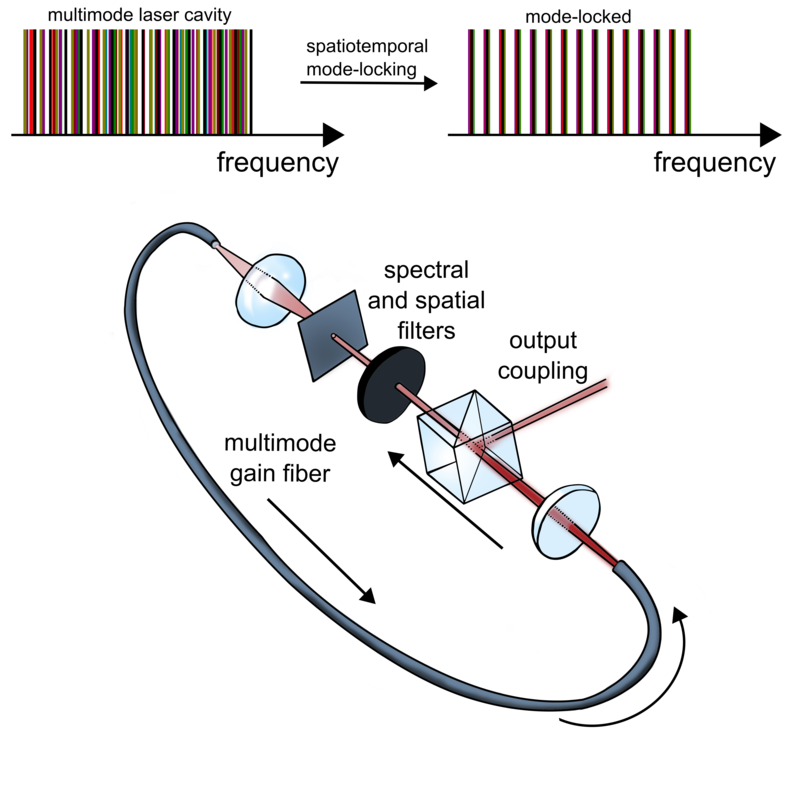 “High-power femtosecond pulses without a modelocked laser” Optica, Vol. 4, Issue 7, pp. 831-834 (2017). Modelocked lasers have long been a mainstay of ultrafast optics. However, they face ongoing challenges regarding long-term reliability, and can only emit pulses at regular intervals. Here, we present an alternative approach by seeding a fiber amplifier with a gain-switched diode. Gain-switched diodes emit pulses that are much longer and less coherent than those from modelocked oscillators. 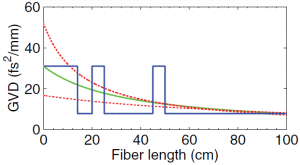 We address these issues using fiber nonlinearities: a Mamyshev regenerator isolates a coherent component of the pulse, and subsequent parabolic amplification allows the pulses to be compressed to 140 fs with 13 MW of peak power. Starting with a gain-switched diode means our system is highly robust and can in principle be electronically triggered in arbitrary pulse patterns. This flexibility may facilitate machining or microscopy sources (where pulses must be synchronized to scanning optics) or enable new types of functional neuroimaging (where specific neurons must be illuminated without saturating an entire sample). 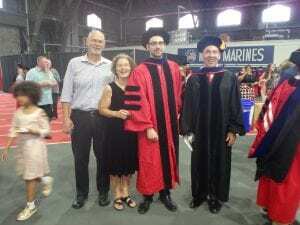 Yuxing Tang, Zhanwei Liu, Walter Fu, and Frank W. Wise. “Self-similar pulse evolution in a fiber laser with a comb-like dispersion-decreasing fiber” Optics Letters, Vol. 41, Issue 10, pp. 2290-2293 (2016). 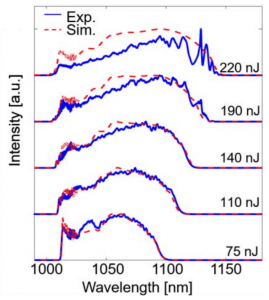 We demonstrate an erbium fiber laser with self-similar pulse evolution inside a comb-like dispersion-decreasing fiber (DDF), which has the potential of generating nJ-level few-cycle pulses directly from a fiber oscillator. A passive DDF is formally equivalent to a fiber with constant gain, and can thus support self-similar pulse evolution but without any bandwidth limitation. Considering the challenges to fabrication of DDF, we try to imitate an ideal DDF with a comb-like DDF based on segments of ordinary fibers, which offers major practical advantages. The laser generates 1.3 nJ pulses with parabolic shapes and linear chirps, which can be dechirped to 37 fs. This constitutes a 4-fold increase in pulse energy compared to previous reports of this pulse duration. 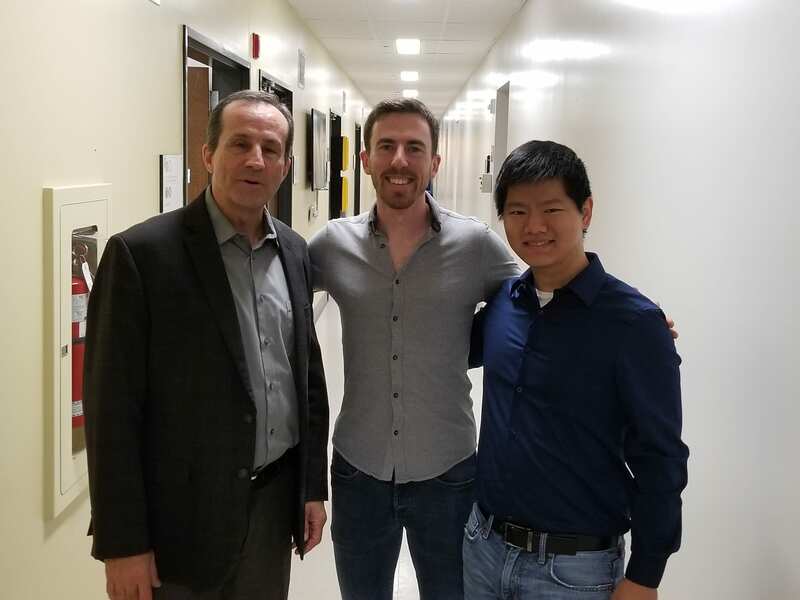 9/11/2018 – Walter travels to the far-away country of Canada to visit colleagues and friends at Université Laval! Pictured below in the company of Réal Vallée and Simon Duval. 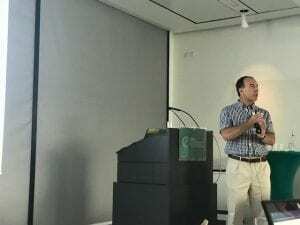 7/29/2018 – Frank returns from speaking at the celebration of 15 years of the Max Planck Institute for the Science of Light. Wise group making waves! 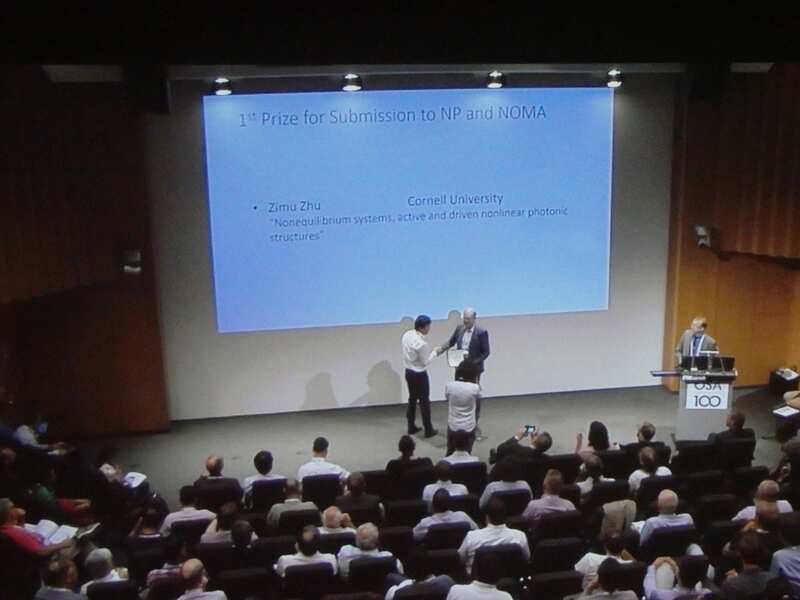 7/1/2018 – Zimu Zhu returns from attending Nonlinear Photonics in Zurich with fond memories, new ideas, and the Best Student Paper Prize. Congratulations! 5/26/2018 – Congratulations to the Wise group’s latest graduate – Dr. Logan Wright! 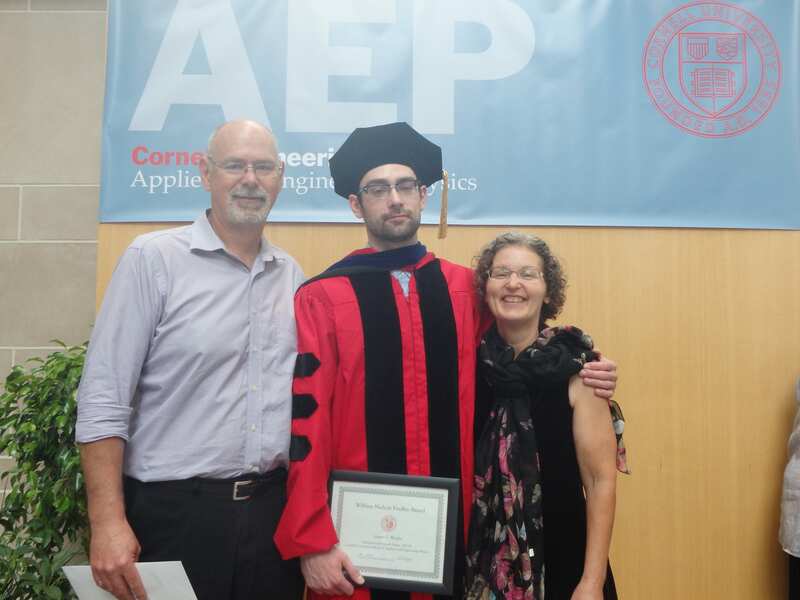 It’s clear that his parents couldn’t be prouder, and neither could we!